Screenshot of a single 1.3 second frame from Windward Community College’s telescope close to the predicted time of the occultation. The relatively faint star that would form a parallelogram with the three brightest stars at the left of the frame is the star of magnitude 15.5 that was predicted to be occulted, though from the final predictions most likely only in a path hundreds of kilometers further north. We observed from Windward Community College on the north shore of Oahu. The photo is our field of view, about 8′x8′, at about the time of the event. The star in question is the fainter one to the right of the bright one at upper left; it forms a parallelogram with that one and the two at bottom left and center. Thanks to Bryce Babcock for coaching us through finding the field from his site at Leeward Community College. Most of our run was clear enough but we did have some clouds in and around the key time. 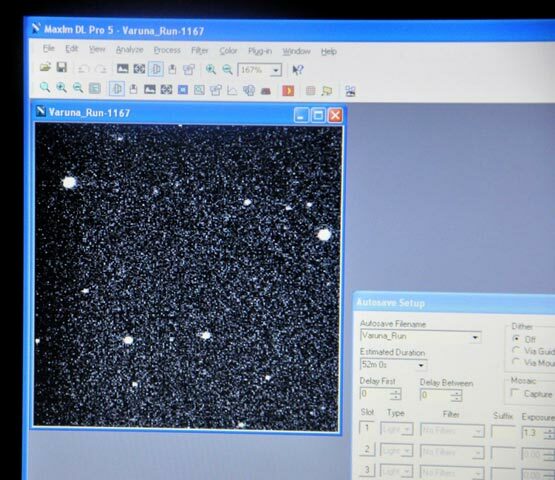 We were running 1.3 s exposures on 2 s cadence with a Meade 16″ LX200 with PICO. We learned that Mauna Kea/IRTF (remote observing run by Mike Person) and Maui/Faulkes/Las Cumbres Observatory Global Telescope (remote observing by Wayne Rosing and Federica Bianco) were clear and saw no event—so it is unlikely that we saw the event, since we are not far north of them. Though the predicted path was substantially to the north, the odds that the southern edge of the shadow brushed us on Oahu yet missed Maui and Hawaii is small. Washington State and Oregon sites were cloudy. Alaskan sites (Anchorage and Palmer) were cloudy. Beijing Astronomical Observatory site in China was cloudy/snow. Yunnan, China, site, was cloudy. Samuel W. L. Plunkett, Jr. In their work on stellar occultations, the Williams College group collaborates with the MIT group headed by Prof. Jim Elliot. See occult.mit.edu. Other members of the MIT group are Dr. Michael Person, Dr. Amanda Gulbis, Carlos Zuluaga, and Amanda Zangari.